you have had enough of using half the kitchen roll and leaving ugly bits of paper on the leaves of your plants each time you want to dust them. you like your indoor plants, you pamper them, speak to them, put on soothing music for them, but when it comes to dusting the leaves, you tell yourself you are missing the right tool. you like the large and majestic leaves of your ficus elastica, avocado, philodendrons and yucca to be nice and green, succulent and bright, and do not tolerate any greyness due to dust on your apartment plants. 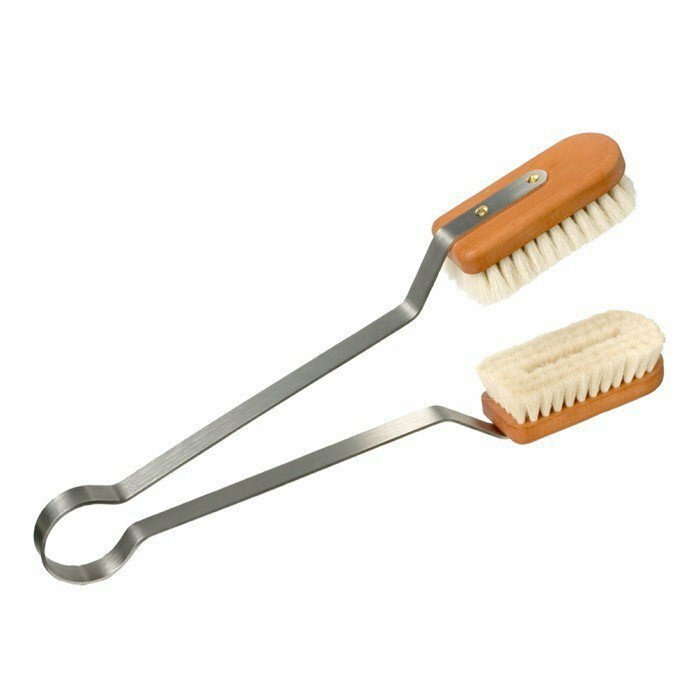 The principle of the apartment plant brush is very easy: 2 brushes are fixed to flexible metallic tongs. All you have to do is delicately position each leaf between the brushes, gently tighten the tongs, and brush each leaf from the base to its extremity. You will of course need to repeat this movement as many times as there are leaves. When you have finished your cleaning, we suggest you also dust your brush. You will avoid bringing dust into its storage place and your brush will be all the more efficient next time you use it. On plants, leaves are where vital chemical exchanges take place: the foliage ensures the photosynthesis, breathing and transpiration processes. In nature, rain ensures more or less regular cleaning. It was even discovered in the 70s that certain plants are equipped with true self-cleaning systems (a dual hydrophobic structure stopping rain drops from dampening the leaf surface, thus allowing rain drops to take impurities away with them). Industry draws its inspiration from this lotus effect to create self-cleaning products known as biomimetics, especially outdoor paints or specific glazing. Let us get back to simpler considerations: in order to clean an indoor plant, a simple way is to put it outside and sprinkle it with water. Others recommend to clean it with a sponge soaked in water, beer or baby milk. But at the end of the day, for simple and regular care, this double leaf brush allows you to dry clean the leaves of your favourite plants, without getting it wet or risking making its nearby environment dirty. natural product - stainless steel, oiled pear wood, goat hair... only sound and recyclable materials! efficient - we have tested it, it works perfectly well: the soft goat hair does not damage the precious leaves whilst efficiently cleaning them..